Solar Energy World has performed thousands of custom solar installations since opening its doors in 2009 and is one of the fastest growing, locally owned and operated solar companies in Maryland, New Jersey, and the DC metro area. Committed to protecting the environment, reducing carbon dioxide emissions, and promoting clean, renewable energy, Solar Energy World provides sustainable energy solutions for homeowners that include high quality products guaranteed to operate efficiently and remain safe for the environment over their entire lifetime. The clean energy company takes pride in its turnkey approach to solar power and handles every step of the process from planning to installation. Solar Energy World strives to make the solar panel installation process as smooth and simple as possible for its customers. First, a Solar Energy World representative will provide a free solar analysis and share information about incentives, payment options, and more. Once the customer has received an analysis and decided to move forward, a certified Solar Energy World technician will visit the home to confirm measurements and energy savings, as well as ensure that the appropriate permits have been acquired. Then, Solar Energy World will complete any necessary paperwork. After that, the company will start on the installation, which is usually completed within two to three days. Once the system is installed, Solar Energy World will set up the final inspection with the appropriate municipality or utility company and ensure the customer's system is properly connected to the grid. Solar Energy World currently offers three different payment options: outright purchase, loan, and PPA. Customers who choose to pay for their system in full or take advantage of Solar Energy World's financing will have the opportunity to cash in on Solar Renewable Energy Credits (SRECs) and other federal and state incentives. The average return-on-investment for customers who purchase their systems is typically around 125 percent within 5 to 7 years. In 20 years, homeowners who purchase solar can expect to see a 500 percent ROI. Customers who choose to go the PPA route can have a system installed on their roof for $0 down. Solar PPA customers will simply pay for the energy being produced by the panels on their roof at a rate of at least 20 percent less than their current monthly electric bill. Solar Energy World has stated that it only installs high-efficiency, best-in-class solar PV panels engineered in Germany, China, and the United States. The company mostly uses solar cells from Hanwa, LG, REC, and Trina. Both ground mount and rooftop solar systems are available, and each system is custom designed by Solar Energy World's in-house engineers to fit the customer's unique energy needs. Solar Energy World remotely monitors every solar system it installs to ensure that the systems are performing correctly. If there is ever a problem with a customer's system, the company will alert them and schedule a service to get things worked out. In addition to remote monitoring service, Solar Energy World provides each customer with access to monitoring technology so they can check in on their system production and electricity consumption themselves. Customers can access the platform from anywhere in the world using a web-enabled device such as a smartphone, tablet, or computer and see how much power their system is generating in real-time, as well as how much electricity the system has produced over its life. Solar Energy World provides a comprehensive warranty on the installation of all the solar equipment it installs. The length of the installation warranty is dependent upon the warranty of the equipment manufacturer and goes up to 25 years. Panel and inverter manufacturers provide a warranty on the performance of the solar panels and inverters. Solar Energy World takes care of all paperwork and permits for its customers to make sure that the process is hassle-free and the customer receives all tax credits, rebates, and grants that they are entitled to. Solar Energy World does not outsource any of its installations or use subcontractors; instead, all of the company's installers work directly for and are accountable to Solar Energy World to ensure that customers receive superior service. The company's solar installers and crew leaders have had years of prior experience and received intensive solar panel installation training. Further, during the solar panel installation process, crews are supervised by a Solar Energy World NABCEP-certified solar designer and installer, as well as a Solar Energy World licensed master electrician. Solar Energy World offers a referral program that even non-customers can participate in. Those who are customers of Solar Energy World can receive $500 for each referral who installs a solar system that is 6 kW or larger and $300 for each referral who installs a 4 kW to 5 kW system. Non-customers will receive $250 for each referral who installs a solar system that is 6 kW or larger and $150 for each referral who installs a 4 kW to 5 kW system. There is no cap on referrals, so an individual may refer as many people as they wish. 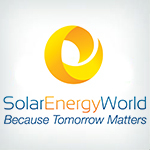 Interested in doing business with Solar Energy World? Click here for more information. Solar Energy World only offers its services in Maryland, New Jersey, and Washington D.C., so if you live elsewhere, you won't be able to do business with Solar Energy World. While being a local provider has its advantages, it also greatly reduces the number of consumers who have access to the company's services. Solar Energy World has over a decade of experience in the solar industry and strives to make the installation process as smooth as possible for its customers. The renewable energy company offers a number of attractive features, including multiple payment options, high quality equipment, an in-house team of certified installers, system monitoring, a comprehensive warranty, and a referral program. Solar Energy World even offers paperwork assistance, which makes the customer experience simple and hassle-free. Solar Energy World is recommended to consumers who live within its service area of Maryland, New Jersey, and Washington D.C. Call our recommended rep over at Solar Energy World below. Or you can visit Solar Energy World website. The sales representative Victor D was exceptionally great. He explained everything to me and walk me through the process. He responded to all my question via email and text. The installation crew was great. They clean up after every work day. My garage door was damage accidentally and the company dealt with the replacement. The field supervisor Henry D came in on a Saturday to make sure that work was done properly with my garage door. Office staffs was great to let me know the status of my paperwork with the City inspection and the interconnect application. I just received a copy of the part 2 interconnect application and I am looking forward to get my electric meter swap and get my Certificate of Operation to get started with my Green investment for a better and clean energy alternative. Solar Energy Wolrd has excellent communication, my work was done professionally and highly recommend them. Great service. Prompt return of phone calls. Very knowledgeable staff at all positions. Installation team was fabulous & explained everything. Everything was explained to me and my wife. what they told us they did,.they finished when they said and then they cleaned up before they left. From designing our system to installing it these guys did a wonderful job. Overall, I think this is a good company to work with- I reviewed solar providers and shopped around quite a bit before signing with them, and their employees are hard working with good intentions. My rating is skewed on the low end, however, because the installed system delivers approx 20% lower kWh than promised when i signed because the original estimate greatly overestimated the number of panels that could be placed on the southern-facing roof. When this was discussed with me prior to install, the discussion focused entirely on the aesthetics of panel placement on the house, and I was not informed that the production would be less and would no longer cover my annual power consumption. Solar Energy World finally explained this to me 6 months later when I called to ask why production was less than expected. They apologized profusely for the "poor communication", but could not provide any remedy, claiming that their production warranties are tied to the number of panels purchased, and not the annual production estimate that was at the top of my contract. I do not believe the company was intentionally misleading- they make deliver good products and the install looks great- but the lack of communication in my specific situation and unwillingness to remedy the lower than anticipated energy production are the reasons I cannot recommend them quite as highly to my friends and neighbors as I did before. We apologize that your experience was not optimum and assure you this is not typical of the customer feedback we usually receive. Please let us know how we can resolve any issues you may have. They were quick and efficient to first install a brand new roof and then to install the solar panels. Everything was fine except that our salesman was not upfront with a few things and then not completely honest. Great experience from beginning to end. From the Sales people to the office staff and finally the crew that did the install and carefully worked to make sure install was and still the best of its type in my neighborhood. Competant, good customer service, timely and knowledgeable. The process from start to finish was smooth. Bryan my contact person was also a people person and very nice person. Explained costs/benefits clearly. Very courteous, professional, excellent price and workmanship. Although the final product is fine, the installation process left much to be desired (the electrical work failed the county inspection). They damaged a item that is not replaceable in my attic during the install. They paid me for the damaged items, but it took a while took get it. My roof had a bad leak after the install as well, but they were fast to come out and fix that. We are fairly new using this system, at the moment we haven't see any improvement but I am sure that we'll see it in the Summer. Their staff doesn't know what they are talking about. Customer service was pretty responsive and kept me in the loop well. Installation went pretty smoothly. The sales personnel earned my trust, they were very knowledgably and helpful. I wasn't pleased that we didn't get the information that our incentives for the county wouldn't be given to us until later on our property tax but as far as the service and installation and everything else I was very pleased with. I think the panels are fairly attractive. It seems to be doing what it is supposed to. They were very professional; they came out they told us exactly what they were going to do. It took a couple of days and they were very efficient. The sales man was very convincing, but I have not received any support after installation. The system is not producing as much energy as they promised. They finished the installation in a timely fashion. The workers did a great job and they cleaned up after themselves. They completed everything on time and the solar panels are working as advertised. The installation process was very efficient and clean. They use good quality products. They kept me informed every step of the way and answered all of my questions. The installation was finished within a day and a half. The installers were courteous and attentive to detail. I have had a couple issues, but they were prompt in responding and fixing the problems. They are very responsive to all of my questions and concerns. They did a good job of trying to conceal the equipment as much as possible. We have a steep roof and Solar Energy World was the only company that could handle it. Their price is very reasonable, but my solar renewable energy credit paperwork didn't get filed properly so it took a lot longer than usual. The workers at Solar Energy World were very courteous and did a professional job. The crew that installed the panels was very coordinated and were always busy while they were working. The company is organized and I am always directed to the right person when I call. The installation went smoothly and they made sure to explain everything to me. I have been having some issues with my unit for the past couple of months and they have been tentative to fix it. They kept in contact with me during the entire process. The installation took longer than expected because it was the hottest day of the summer. Salesman explains the product very clearly. Unfortunately I did not go forward with the installation. Didn't think it was best for me. Outstanding hard working and incredible. Just page down the reviews and discover the majority are all dated 9/12 or 9/18. It appears the marketing dept wanted you to see this important information before the fall sales blitz. As a solar energy advocate and finding this company surpasses the performance of all the others, the same date submissions looks sketchy. Check out everyone’s reviews on all the companies before you decide. After building a new energy efficient house in 2014, we had always planned on a solar installation in the future. I did my homework on other solar contractors and finally selected Solar Energy World earlier this year. Our project was a little more complicated since we had a detached garage structure (separate from our house) where all our electricity comes in, as well as a backup generator. My salesperson Will was very informative and presented the various options clearly regarding system size, financing, etc. Having been around for all of our house construction, I was familiar with contractors being on site, and must say I was very impressed with the quality of work of the electrical and panel installation team, as well as the on-site project manager Henry. Workers were on-site 4 days total, and did a first class job installing a 15.3 kWp system (51 panels) on our metal roof. The electrical team even went the extra mile of spray painting the metal conduit to match the brown metal roof so that it would blend in with the roof color. The system took longer than originally planned to get installed due to delays with approvals from our utility company (PECO) and local township, but these were out of the control of SEW. It is great to see the solar production showing now on the SolarEdge website, and we anticipate being "net-zero" with this installation. Highly recommend Solar Energy World for your solar requirements. Thank you for the five stars, Stan! We are so happy to have you as a satisfied customer. My agent Wyatt was down to earth, spent 3-4 hrs answering all my questions and got us additional discount. We are happy with our deal and are looking forward to the installation. This company provides the best warranty: 20-25 yrs for panel, inverter, and installation work. Your great review is very kind and appreciated! We decided to go solar through the Montgomery Co-op of Solar United Neighbors since we got a better price and warranty. Solar Energy World was the company selected by the co-op to install our 9Kw/30 panels solar system. We had a very poor experience with the company and in particular with their solar analysts. The two solar analysts who worked on our project showed a incredible lack of knowledge and customer care. Our first solar analyst, Mr. Jay R quoted us for a much bigger system (44 panels/13.2kW) that what we actually needed and he had a hard time following up with us. We had to ask the CEO of the company to work with another solar analyst. The second one, Mr. Bryan H was better following up, but did not demonstrate the proper knowledge regarding roof penetrations and his way to answer our questions was really condescending to a point that we were afraid to ask. Even when we requested a second meeting to review the project prior to the installation, he claimed that he did not have time to meet with customers more than once and this is the way that the company works. It should be noted that Mr. H is the Vice-president of sales of the company. Regarding the roof penetrations, we needed a new roof before installing our solar panels, so I mentioned to Mr. H that the roof company could mark the location of the trusses where the solar array is attached since I did not want extra new holes in our brand new roof. Mr. H told us that was not needed since the company uses a method to exactly locate the trusses by measuring and chalking roof. The day of the installation we discovered that the company actually uses echo location to locate the rafters (i.e. they tap with a mallet or a hammer and roughly locate the trusses solely by the sound), as one can imagine with this method it is really easy to miss the trusses. As a result, we ended up with a bunch of holes in our new roof that they had to caulk. I recommend to CEO that his company should invest in proper electronic truss finders to avoid this problem. The company only measures and chalks roof trusses in situations where they cannot identify the trusses from above the roof with a mallet. We were really surprised that the Vice-president of sales was not aware of it. We could have avoided all those extra penetrations in our roof. Mr. H also omitted to tell us that the company charges an extra fee to finance the system of roughly $2000 (apart from the money that goes to the loan interest) which would not have been charged if we paid cash. Finally and not least, he encouraged us to turn on our system before passing the county inspection. Thankfully we did not do it since the crew that installed our system told us that could cause the electric company to charge us twice (for the energy that we consume and the one that we produce) since we needed a new meter that knows the amount of electricity that we are producing. The company never gave us a detailed report of the project (for instance the specifications of the solar panels and the inverter, where things will be located and how the condos would be run) prior to the installation, even when we asked for that information. After the installation I got the specs of the solar panels and the inverter after a direct request to the CEO of the company. Furthermore the company never gave us or even offered the manual of the inverter. In contrast, the crew members that did the installation were very professional, they replied to all of my questions and they spent a good amount of time explaining things to us. The CEO of the company is aware of these issues. A solar system is quite a big investment and we believe that we deserved better customer care from Solar Energy World even when we are part of a co-op. We would like to add that we received several calls from Mr. Geoff M, the CEO of the company, after this review had been publicly released. The company took our complaints very seriously and we are optimistic that the chain of mistakes that make us fall through all the cracks that the company had will never happen again to any other customer. It is unfortunate that we are the first and most likely the last and only bad experience that a customer will have with the solar analysts of Solar Energy World. We believe that Mr. M will take measures to prevent an unfortunate case like ours by improving the techniques that his company uses to locate the roof trusses, and the quality, knowledge and customer care of his solar analysts. We value your business and are glad your concerns were addressed and that you are ultimately satisfied with your experience. Please know that 95% of our customers have given us outstanding reviews, so we are sorry your experience was not up to par. Per the conversation you had with our CEO, Geoff Mirkin, rest assured that we will be there for you should any other issues arrive. They're quite attentive. The installation was very easy, and the quality of the equipment is very good. We appreciate your business. Thank you for the kind review! They were very responsive to my questions and provided whatever information I needed. They came in the morning explained what they were going to do and covered any concerns I may have had and then installed and they were done by mid mid afternoon. It's all working well, no complaints and it's been a year and a half. We're still waiting on them to fix something. They took care of everything, it was hands off for us. It's been running for several years now. They were they would put solar on the cedar shake roof a lot of people won't used cedar shake roofs. Any issues or problems that we have they've address immediately and were always very courteous and helpful. It went smoothly no problems, we didn't have to be home and they cleaned up after themselves it was very smooth. It took longer to do part of the operation when I saw it and then I had to do some follow up which wasn't good. I have no trouble with my system now. I had to have the panels removed and they were pulled off and put in the wrong place when I wasn't there. Everything was done when they said it would be and the installation was very smooth. We've had zero issues with it, it just works. They are responsive and they call me back. I'm having trouble with the solar system which cannot be solved so I'm not happy with it. The price of the overall package and panel and also the size of the panel are why we chose Solar Energy World. The panels are larger with Solar Energy World than they are with some of the other companies.Great customer service, very professional very personable people you want to deal with. We had no issues with the installation process that was very, very smooth. They answer all my questions and take care of what we need to do. The installation was fine and efficient and it works very well. We like the quality of the panels. Brian our salesman was with us every step of the way. They were pretty responsive when it was going and it took a little longer than I thought it was going to take but they got it done by my deadline so I was appreciative of that. Thank you for the great review, Doug!